As we gear up for the 42nd U.S. Marine Corps Marathon, where Rosslyn will host the Finish Festival October 22 (be sure to check it out; it's not just for runners! ), we're featuring articles about one of life's most freeing and accessible fitness activities: running! In this second piece, we explore trail running (and walking) on a wonderful slice of nature nearby, Theodore Roosevelt Island. Each week, the island is home to free, timed, 5K "parkruns" organized by volunteers every Saturday morning. We've done parkrun and we highly recommend it! If you try it sometime, too, post it on social media with #RunRosslyn. We'd love to hear about it! Crossing the bridge onto Theodore Roosevelt Island is a bit like entering an enchanted forest in a fairytale: A lush canopy of leaves, formed by hundreds of mature trees, shields you from the sun. Ahead, unpaved trails twist and turn around natural beauty as rough and untrimmed as a remote strip of the Appalachian Trail. Not far away, look back and confront thrumming arteries of traffic, pedestrians, cyclists and busy city life: Georgetown to the east, Rosslyn to the west. But on the island, you sense peace and quietude completely separate from the world you inhabit on the other end of the bridge. A memorial to our 26th president, the 88-acre island is a wonderful place to escape anytime, whether it be during a busy work day, in the evening, or on the weekend. Rosslyn is its only access point: It can be reached on foot via N. Lynn Street and the Mount Vernon Trail. The island's network of unpaved paths makes it a great place for walkers and runners alike. One group that has made a home on Theodore Roosevelt Island is parkrun USA, a volunteer-led organization that hosts a free, timed, weekly 5K run/walk/jog there every Saturday morning at 9. Parkrun USA is affiliated with a global, nonprofit movement of 1,200 parkruns with over 200,000 people worldwide participating every weekend. Parkrunners complete a one-time online registration to join a weekly run and receive their personal barcode they can use anywhere in the world. The barcode is scanned to record a person's time at the end of the run, which is later posted online. 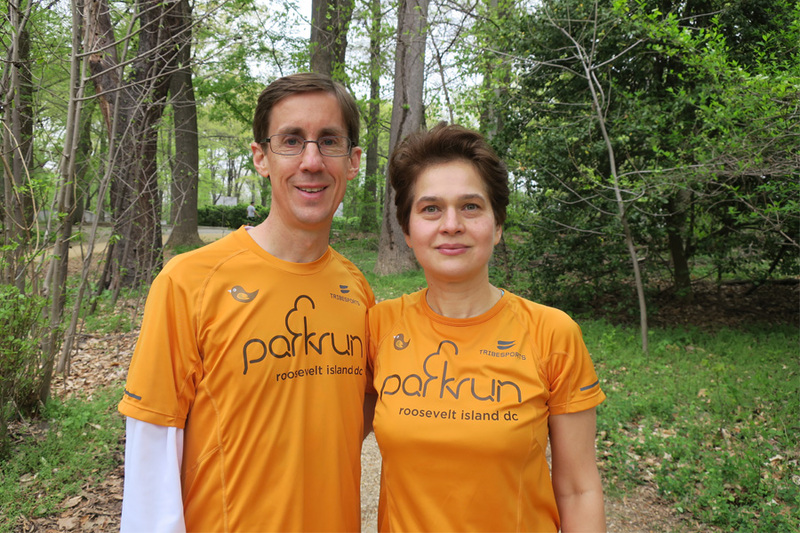 Darrell Stanaford, parkrun USA country manager, started the Theodore Roosevelt Island parkrun with his wife, Svetlana Stanaford, soon after they moved to the D.C. area in summer 2015. Every week, a core team of six or seven volunteers works together to organize the run by setting up the course signs and recording runners' times. On a typical Saturday morning, parkrun hosts about 50 participants, including tourists and Rosslyn residents who range from elite runners to kids to older adults. Darrell says one of their most dedicated parkrunners is a 75-year-old Rosslyn resident who was one of five women in her age group to complete the Cherry Blossom Ten Mile Run earlier this year. Darrell says the whole ethos of parkrun is that "running should be accessible and affordable rather than elitist and cost-prohibitive." He stresses that parkrun is a run, not a race. "It's not meant to be a competition, but rather an activity for everyone," he says. "We have serious runners, but we also see kids out at parkrun. We have lots of walkers, too, and many of them take more than an hour to complete the course. We have a designated tail walker whose job it is to follow the last person. We don't leave anyone behind." Svetlana says she loves the community of runners who make up parkrun. There's a very positive energy to parkrun," she says. "It's like all the runners get energy from each other. Many people confirm that parkrun changes their lives in important ways. It helped parkrun's founder, Paul Sinton-Hewett, overcome depression. At the time he started parkrun, he'd lost his job and gotten injured, so he reached out to some friends and said, 'I'm doing a timed run in the park. I want you to join me, and you have to go for coffee with me afterwards.' And that's how it all began. Parkrun is all about community." If you want to experience parkrun for yourself, be sure to sign up and join one of their weekly timed runs on a Saturday morning. It's a wonderful, low-pressure way to meet new people, enjoy nature and take part in a healthy outdoor activity. But beware — it's habit forming! Photo at top: Cross the bridge onto Theodore Roosevelt Island near Rosslyn and you'll quickly find yourself in an oasis of natural beauty that seems light years away from our busy urban environment. Photo at middle: Darrell and Svetlana Stanaford started the weekly parkrun on Theodore Roosevelt Island in Rosslyn. Darrell is also the country manager for parkrun USA. Photo by Mary Dempsey.